The Go-Go Elite Traveller® Plus was designed to bring travel scooters to a greater range of people than ever before. An increase in length and width and a weight capacity of 300 lbs. combine with a wraparound delta tiller to allow both larger individuals and those with limited dexterity to experience the benefits of a travel specific mobility product for the first time. Feather-touch disassembly makes Pride’s Go-Go Elite Traveler Plus the easiest travel scooter to take along anywhere. 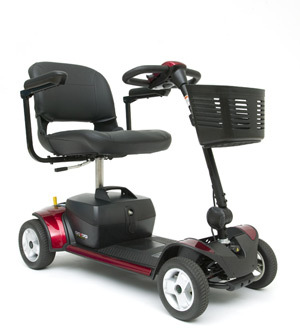 This scooter is available as a 3-wheel or 4-wheel scooter.Go-Go Elite Traveller Plus from Pride Mobility comes standard with 18AH batteries to keep you on the move, providing up to 12 miles of travel per charge, and with 3 inches of clearance you can travel over un-even surfaces easily. This travel scooter is suitable for users needing a higher weight capacity thanks to a larger chassis. 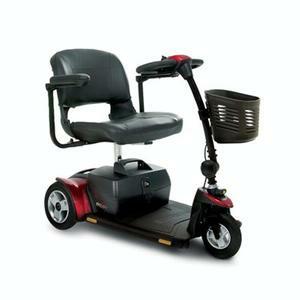 The convenient features such as flat-free tires, a front basket and interchangeable color panels are all standard.